Digiarty Software Inc., a resourceful multimedia program developer, announces the continuation of rendering a service to Window XP users in its whole product line, such as for DVD ripping/copying/burning, HD video conversion/downloading and movie streaming. This solid promise comes with a rebate offer embodied in the all-in-one 2014 Spring Gift Pack valid before April 10. The end of support for Windows XP on April 8, 2014, one of the shocking news hovering over head recently, is now walking up to the vast Windows XP customers and partners. "It may be the turn of Microsoft operating system, but not the finalization of software service," said Jack, President of Digiarty, "To that end, we will protect all Windows users with free security and feature updates and technical support in all our Windows programs in the long future and will never left XP behind." 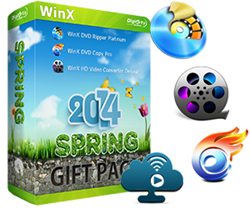 WinX DVD Ripper Platinum: makes digital versions of homemade DVDs, commercial DVDs and latest movie DVDs while offering different options for output formats, file size and quality standards; also acts as a fast solution to back up DVDs in 4 modes; it supports basic DVD video editing needs. WinX DVD Copy Pro: guarantees no quality loss after copying a DVD even it is infested with scratches, fingerprints or bad sectors; the original DVDs can be cloned to new DVDs, ISO virtual drives, MPEG2 files and DVD folders for fair use; also function in audio/video/chapter extraction, ISO mounting and DVD burning. WinX HD Video Converter Deluxe: not only a HD/UHD video converter, but also an online YouTube video downloader, a photo slideshow implementor and a video editing utility; it takes in all kinds of videos, including multi-track HD videos BDAV, M2TS, MKV, AVCHD, HDTV and MPEG-TS, camera videos, website videos, and common AVI, MP4, MPEG, WMV, MOV, FLV, WebM, VOB and 3GP videos and the like; it has about 300 preset profiles for any popular devices, such as iPhone 5S, iPad Air, iPad Mini, PS3, PS4, PSP, Xbox, Android tablets and WP8. Air Playit: A small-sized and useful program for streaming all kinds of music, audio/video files and movies to Apple iPhone and iPad as well as Android gadgets; it is composed of a server part and an app client part. For Windows XP users, they are still the commendable ways to systemize their home theater and have an enriched recreational life. More surprisingly, Digiarty is offering a Spring Gift Pack that comes with a 74% off discount covering all of the products below side by side. All of them are fully licensed with complete functions and services, and especially, WinX DVD Copy Pro is also available for free due to the Spring Giveaway.